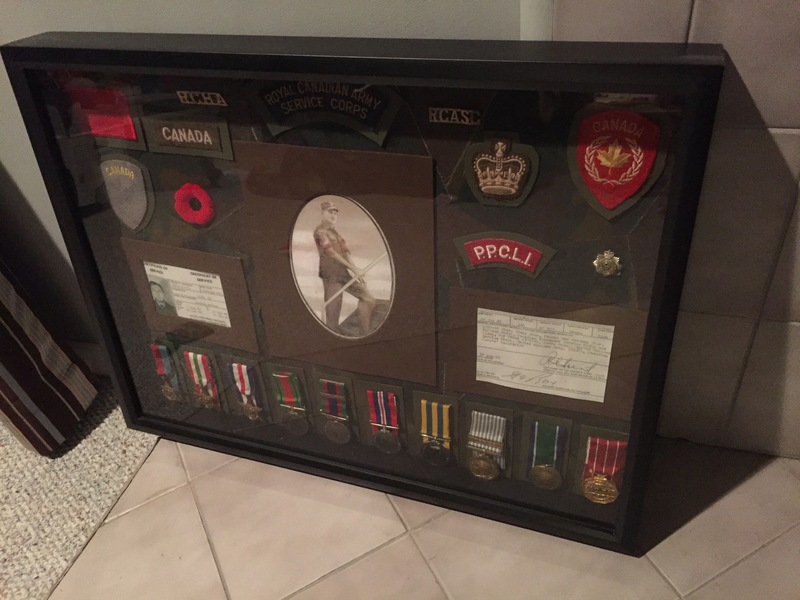 For Remembrance Day this year (or Veteran’s Day for my American friends), I’d like to honor my late grandfather-in-law and dedicate this post to him. 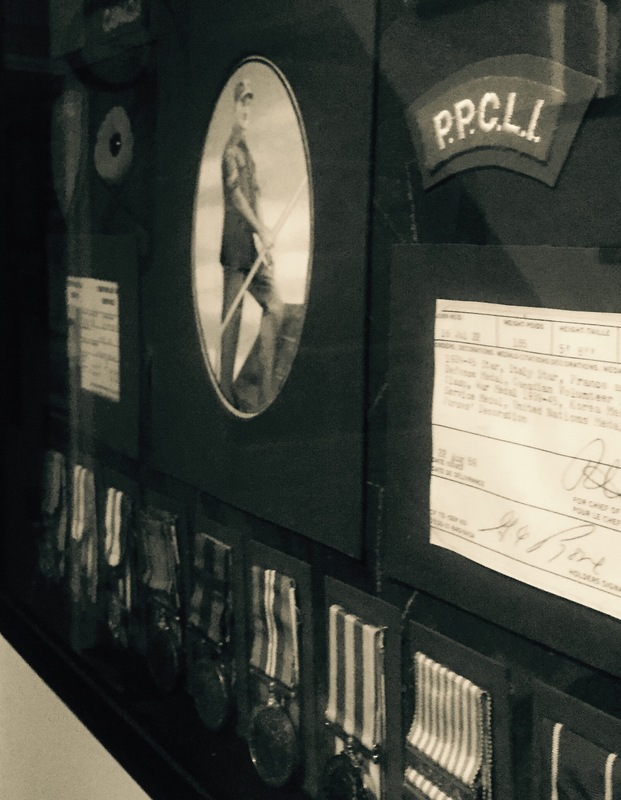 He served his country in the Princess Patricia’s Canadian Light Infantry, and today is a day to pay tribute to him and soldiers just like him who fought for our freedom. 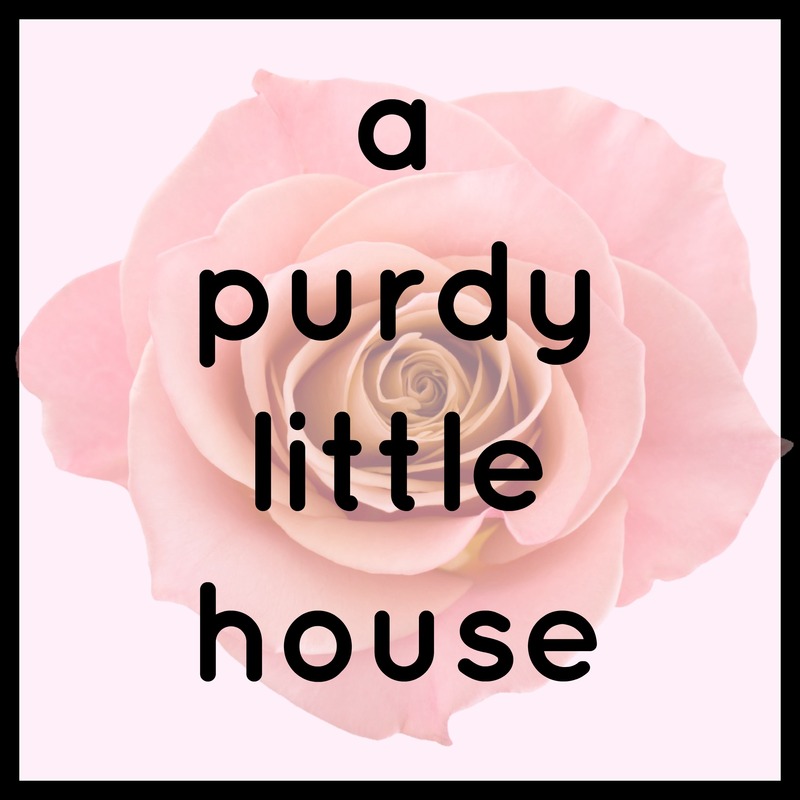 His story is one that could be made into a movie, starting with his leaving his family home as a teenager, lying about his age, and enlisting in the army. Soon after, he was overseas, fighting in WW2, most notably the Battle of Ortona, the liberation of Holland and later in the Korean War. He was one of the lucky ones to have been able to return home to his wife and two children. He spent his retirement working as a pig farmer in Southern Ontario, and later moved to Victoria, British Columbia when his grandchildren got older. 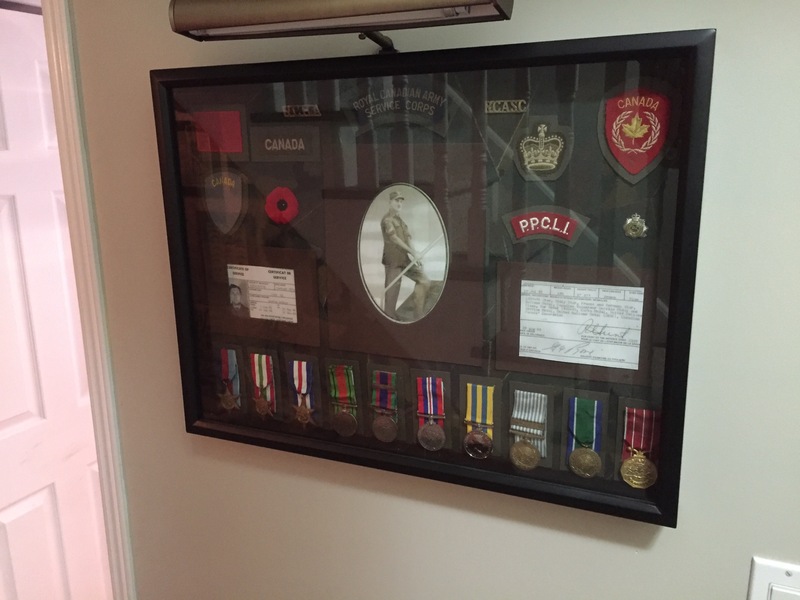 My husband was privileged to have been given all his grandfather’s original patches and pins from his army uniform. 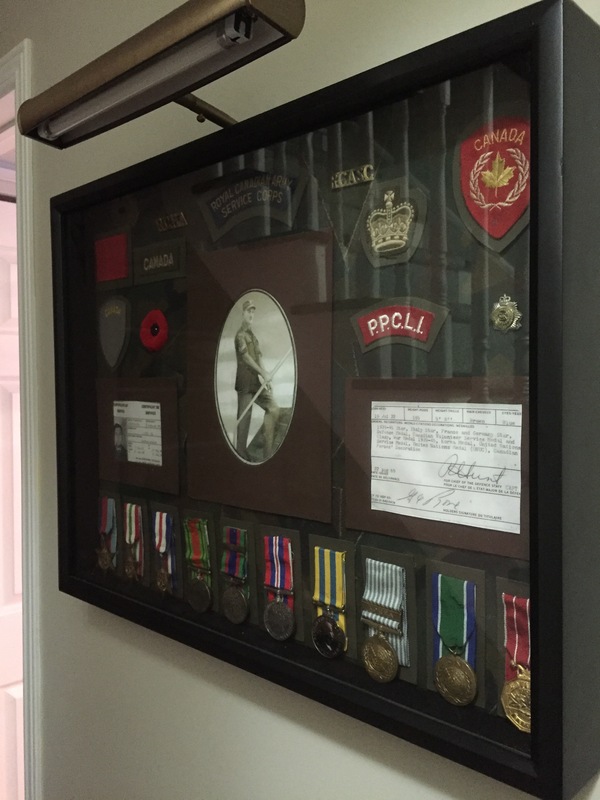 Knowing the sentimental value of these items, and since crafting and decorating are my language of love, I created this shadow box for him in the month after his grandfather’s passing. It’s hard to see (with the glare of the glass), but I used a green suede for the background, and ripped up square patches of camo fabric and glued them in place with fabric adhesive. My friend was able to work some photo-shop magic with an old newspaper clipping of him boarding a plane on his way to Korea. She was able to sharpen the image from the original newspaper photo, and take out all the background noise that was too distracting. This photo now sits front and center in the shadowbox. He rarely spoke about his time overseas, as humility was in his nature. 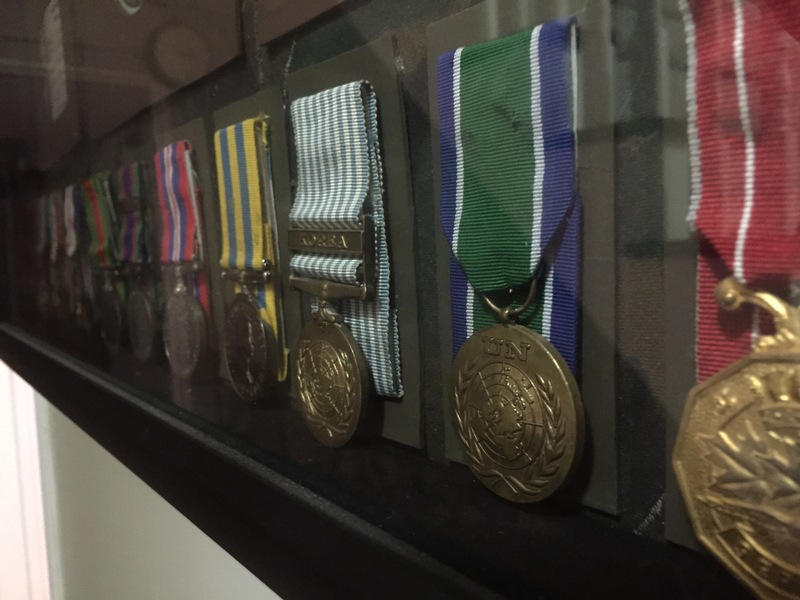 No one would ever have known that he was awarded a total of ten medals. Each medal and patch was giving its own custom matting that was painted a coordinating green or brown tone to match the camo. 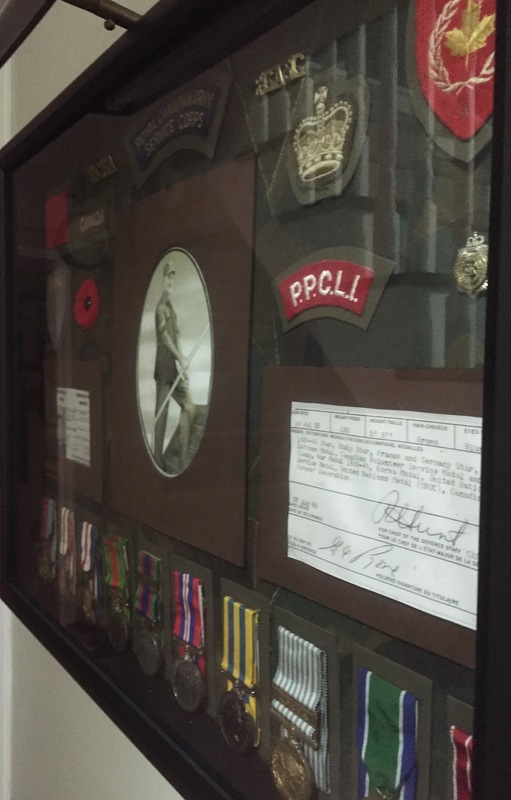 This shadow box hangs in one of our frequently used hallways (I just took it down to try to get a better pic.. epic fail, I know…lol), and I love having this reminder of a history of life, loss, and freedom in our home, so that we can be reminded every day. See you all again soon everyone. I’ll be back again later on this week with a new post.